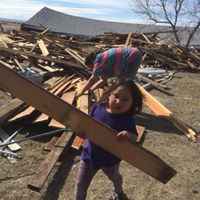 Working alongside the Lakota People of Pine Ridge Indian Reservation we will deliver firewood across the reservation, complete the construction of a home for a Pine Ridge family and repair and winterize homes damaged in a July hailstorm. The Race to Winterize Pine Ridge Homes is On! In July of 2018 there was a devastating hailstorm and tornado that tore through Pine Ridge leaving a trail of destruction in its wake. FEMA declined to provide much needed assistance and tribal officials have directly asked The Tipi Raisers and our corp of volunteers to help in whatever ways we can. Thus the Tipi Raisers is establishing a temporary work exchange program to work on as many of those homes as we are able to, to cut and distribute badly needed firewood as well as to complete the construction of the Belt family home. Starting in mid-October and running indefinitely, the Tipi Raisers will establish the 24/7 WORK EXCHANGE program on Pine Ridge to assist Pine Ridge families in preparing for winter and providing badly needed repairs from the storm. While we have received some initial funds from generous donors to get the Work Exchange program started, your donation to the Race to Winterize Pine Ridge Homes campaign is needed in order to have the greatest impact possible! My daughter Beth Hoover & husband Gary told me about the great work you are doing at Pine Ridge. Blessings to you all! I really appreciate all the good work you when your foundation are doing to help the Lakota people. Thanks for all you do. Thanks for providing an incredible experience for Finley, Maddie and Hayden! My boys had an amazing experience at Pine Ridge last summer and look forward to going back next week to reconnect with the Pine Ridge community. Everyone deserves to be warm during the winter and live in dignity. Matthew 25. May the good LORD bless your project and grant your people shelter before the winter comes.